With the passing of David "Kidd" Kraddick last Saturday, thousands of us all across Dallas feel like we've lost a dear friend. A friend most of us had never even met. When you listen to a personality on the radio for 29 years, you do become intimate with their personality, family life, quirks and pet peeves. The reason Kidd was so beloved wasn't just his witty banter, ditties on the keyboard and funny radio bits. It was his passion for others and his dedication to making the world just a little bit brighter for those who needed it most. In 1991, Kraddick founded the 501(c)3 charity, The Kraddick Foundation, which is dedicated to helping impact the lives of children who have terminal or chronic illnesses or are accident victims. It consists of "Kidd's Kids," which takes a planeload of these children (age 5-11) and their families to Walt Disney World for 5 days every November. In 2010, the charity grew to include "The Glamour Squad" which visits hospitals around the country and provides a day of pampering inside the hospital for teenage girls. Listeners of the Kidd Kraddick in the Morning show donate money one day a year on "Kidd's Kids Day" to help fund these projects. One of the things that I have heard loud and clear from Kidd's family and co-workers this week is that his legacy will live on. In times like this, it's easy to feel helpless, sad and to wonder what you can do to help. 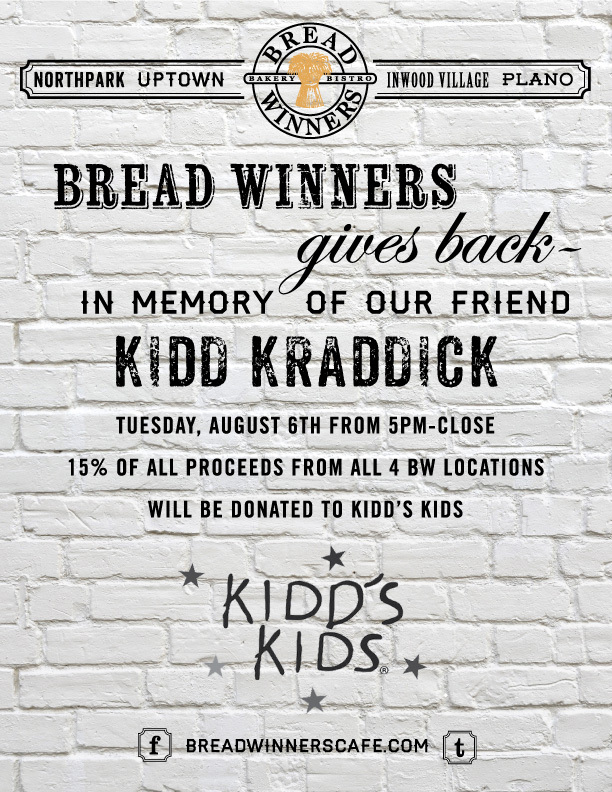 Bread Winners Bakery & Cafe is giving you a simple way to show Kidd you care. Visit any of Bread Winners four locations on August 6, 2013 from 5pm – close. 15% of sales from the evening will be donated to Kidd's Kids in memory of Kidd Kraddick.